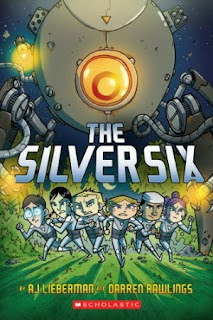 We loved reading The Silver Six! My 9 year-old son read it first, all in one sitting, and then I did too. Finally, my hubby picked it up and enjoyed it just as much as we did. We just couldn't resist six orphan kids who worked together to overcome obstacles to find a home. This book stressed the importance of family and the value of friendship. It was full of good messages for kids! Set in a futuristic world, a group of kids in an orphanage find themselves with one thing in common. Their parents had all left them a moon registry as a gift. Phoebe and her pal Oliver lead them in an escape to an uninhabited moon where the kids realize how much they want to have a place called home. They discover more about their own parents and exactly what role they played in the company Craven Mining that had them killed. This propels them to fight back against this corporate boss who has sent a henchman after them. All of us liked the characters in this story. The six kids were all from different nationalities and had both strengths and weaknesses. Phoebe's robot Max was hilarious and my son and I loved their relationship. There were many funny laugh-out-loud moments in this book. The six kids acted their age, but also showed maturity because of being orphans. There were a few touching scenes too that brought tears to my eyes. The illustrations were great, especially the emotions on the kids' faces. My son thought they were cool and he couldn't put the book down, reading it all in one hot afternoon during our vacation in Rome. One night after I put my son to bed he said he was thinking of the Silver Six kids because for him they were like superheros. He wants to read more books from these authors, both dads whose obvious experience in parenthood comes through loud and clear in this fun action-adventure tale. We highly recommend this graphic novel for all middle-grade kids. It has good messages about family and friendship. It encourages kids to work together and helps them understand that even bad people can change. We will definitely be looking for more books from these authors! Note: This book is rated V = mild violence. There are some shooting scenes with guns and explosions. However, no blood or gore.